Morning ladies seeing as we're fast approaching the end of January, I thought it would be fun to share with you some pictures from Laura Ashley's press day, which I attended back in November & show you what they have in store for us over the coming months. You may recall that I've featured their AW16 collection here & over the past few months I've found my grey wrap coat so useful for throwing on over most outfits - smart or casual that it's fast earnt a place in my wardrobe & replaced a few old coatigans. As I mentioned in my previous post Laura Ashley is definitely worth keeping on your radar for timeless, well made pieces & for fellow ruffle & lace lovers you'll see from the snaps I took at their press day there's lots coming into store to keep us happy. In fact there's already a few new in pieces that are catching my eye starting with this stunning pintuck tuck lace blouse. Just perfect for teaming with boyfriend jeans, an oversized cardi & trainers for a casual every day look or paired with a biker jacket, heels & cigarette pants for a smarter occasion. I also love the idea of this knitted ruffle dress - perfect for pairing with ankle boots & a biker jacket not to mention so cosy & easy to wear during these cold & dark days. Plus these grey skinny jeans look the perfect fit of 'skinny' - not too tight or loose & such a real wardrobe staple for most of us. Then of course there's this knitted jacket, which will totally come into it's own during the warmer months. Perfect for dressing up as much as down, you just can't beat this style of jacket worn over a simple tee with trainers & jeans. You may have noticed in the collage above that this dress caught my eye at their press day. I just love the fray edge detailing & pretty scoop neckline. Plus it's such a great stylish take on an alternative to a denim dress. 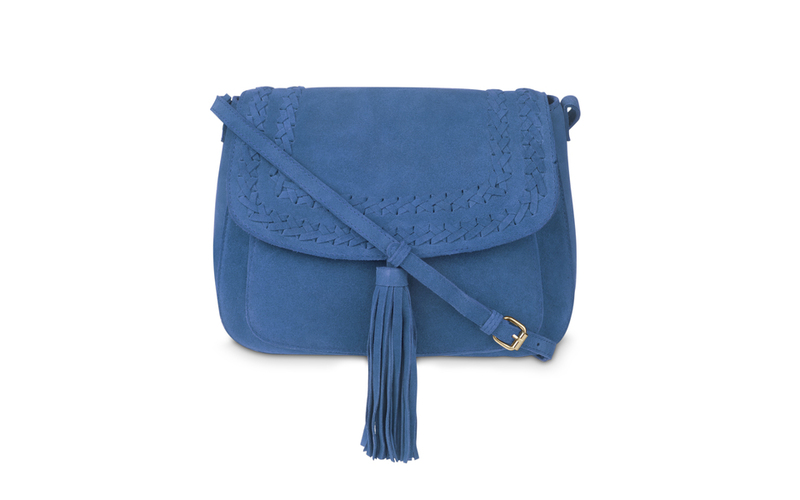 Also how lovely is this suede across body bag - a great size for holding all the essentials plus ideal for injecting a little bit of colour & pairing with all the neutrals our wardrobes hold. As I've already mentioned there's lots of temptations from their new collections already hitting their stores, in fact I've put together my top 10 picks of their latest drop below. These next few photos were also taken at their press day & I thought I'd share them with you so you can see what Laura Ashley has in store for us in the coming months. How pretty is all this lace detailing set to hit their stores later in the year. I'm already thinking the grey lace dress would be perfect for Ladies Day & firmly have my eye on the navy maxi dress for holidays. Now I've been lucky enough to have been sent a couple of pieces from Laura Ashley to style & needless to say it was a hard decision deciding which two pieces to pick but in the end I picked the suede cross body bag. I don't know about you but I find cross body bags extremely useful to own, as who doesn't find it easier being hands free & like I say it's perfect for injecting new life into old winter favourites as you can see from the below images. It really does transform a plain grey outfit. Me being me, the second piece I just couldn't say no to was their knitted jacket. As you all know by now I have a huge jacket weakness & this knitted beauty is perfect for dressing up or down. Plus it's such a lovely shade of blue it's ideal for teaming with all the greys, blacks & navys hanging in my wardrobe. I'm actually wearing the jacket today & for it's first outing I just couldn't resist dressing it up by pairing it with my cropped kick flare navy trousers & lace detailed blouse & adding a leopard print bag for a bit of interest. Size wise I'm wearing an 8 & would say it's true to size. So ladies have you spotted anything that takes your fancy? I must admit I'm seriously contemplating investing in the white pintuck blouse as I just love the idea of dressing this down for everyday & we all know you can never have enough white blouses/shirts can you, as they're just so useful! ;-) I'd love to know if you've spotted anything that takes your fancy. Right I'm off to start the day. Happy Wednesday ladies, have a good one & as always I'll see you tomorrow. 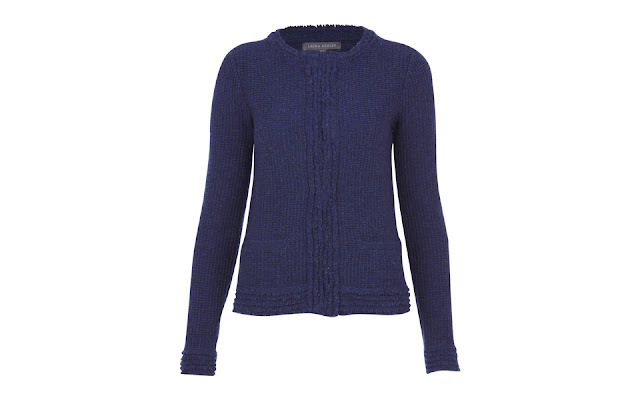 Plus if you've been waiting for a Boden discount code there's 20% off all knitwear & outerwear for today only. Just click here & use code 6T2C at checkout. Gosh Jane, it used to be that fashions came back in a 20 year cycle, but seems that we only had pink coats 2-3 years ago. I'm aware that perception of time speeds up commensurate with age but seeing that LA pink coat today has scared me! That French navy jacket is gorgeous and I love the way you've teamed it with that ravishing lace blouse. x. Pink is set to be huge next season Mary so it's perfect for anyone who has anything lurking in the back of their wardrobes from a few years ago. Plus of course it's perfect for teaming with denim. How stunning would the pink coat look with a simple white shirt & boyfriend jeans?! As for my new jacket & bag, I can see fast becoming great new staples to my wardrobe & being blue they go with so many things I already own. I have pale pink suede loafers which is probably about as pink as it is going to get for me. Not my colour near my face. Actually I have a deep raspberry LG bag but that's not really pink is it? Pale pink doesn't suit everyone does it Susan, although there's always a few tricks such as wearing a scarf that is more flattering to your skin tone, or finding a more flattering shade so you can still wear a colour if you want to. Personally I don't think you can beat a splash of colour with accessories & I'm loving the sound of your pink loafers.....now we just need Spring to arrive! I have the coat as part of my great autumn revamp. I'm now drawn to the frill jumper. Now I "don't" do frills of ruffles as they can swamp me but that is grey which is my favourite base colour and it is subtle I might put my toe in a trend which is not going away just yet. I've also seen the "two types of stripes" jumper at Women's society which maybe my foray into stripes. The last jumper from yaya was such a hit with me I'm very tempted. Can see all those items above on you - don't know how you chose just two. Yup ruffles & frills are going no where this season & that grey ruffle jumper is just gorgeous & the most perfect shade of grey. You should definitely give frills & stripes a go. I'd be lost without mine & yes it was very hard to choose which 2 to style!